As a New York Doctor, Dr. Gafanovich is well-aware of the level of trust that must exist between doctor and patient in order for true healing to occur. The treatment of an illness or disease is more than just handing you a bottle of pills and a bill. You are entrusting us with your health and well-being, and that is both a physical and an emotional commitment between our “family” and yours. We are dedicated to providing you with the best, most professional and compassionate care in all of Manhattan! Manhattan Internist Dr. Gafanovich: We believe in an integrated and humanistic approach to primary care—we treat patients, not diseases! We realize that often patients are looking more for emotional support than just a prescription and Dr. Gafanovich will ensure that your voice is heard and that you are able to express your concerns and your expectations. Visiting a doctor’s office should not just be about waiting for an hour and be dismissed in fifteen minutes after. It’s about your doctor listening to your medical concerns and explaining to you what needs to be done and how it will be done. Patients are also often confused about the medicine they are being given, the dosage and the duration of treatment. At our clinic, you can be assured that whatever treatment Dr. Gafanovich determines is right for you, she will explain her reasons and why she came to a certain diagnosis. NYC Doctor, Dr. Gafanovich and everyone on her staff are here because we want to make a difference in our patient’s lives. We spend time taking a thorough history to understand the nature of a patient’s complaint. We want to understand what he or she needs from us, as well as, her fears in regards to health and treatment. Our goal is to integrate the biological, psychological, and social factors that affect the state of health for each individual. Our philosophy is to treat the underlying problem, as well as, the symptoms. We focus on primary and secondary prevention of diseases to build a healthy foundation for the future of each patient. 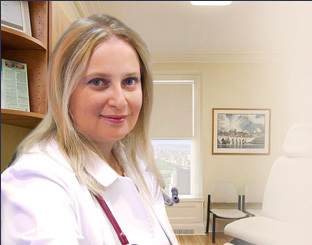 Upper East Side doctor, Dr. Marina Gafanovich, MD: We are our patients’ best advocates. We teach our patients to recognize the tremendous healing potential that they have within themselves.